MANILA, Philippines - Congratulations to our newly promoted policemen! The National Police Commission (NAPOLCOM) officially released on Tuesday, June 20, the partial results of promotional examinations conducted on April 23, 2017 in designated schools in Metro Manila and other testing centers nationwide. NAPOLCOM Vice-Chairman and Executive Officer Atty. Rogelio T. Casurao announced the full list of passers for Police Officer (PO) exam. A total of 2,440 out of 6,634 (36.78%) passed the tests. 17-04-1605184, JAVELOSA, BEN GERALD . 17-04-1606459, NEBRES, JOHN PAUL . 17-04-0505132, PANGANIBAN, LUKE IVAN . Aside from PO exam, the commission also released results for Senior Police Officer (SPO) and Philippine National Police (PNP) Entrance Exam categories. The results of the Police Inspector and Police Superintendent exam categories shall be released soon. 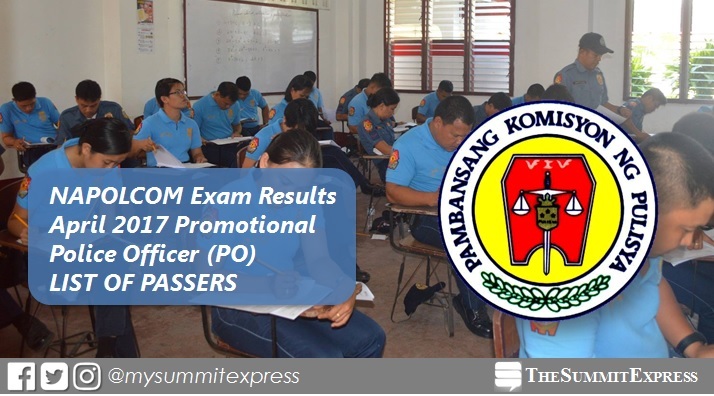 “The immediate release of the results of police exams is in consonance with the Commission’s commitment with the PNP and the Department of Budget and Management (DBM) to make the examination results in synch with the police recruitment process,” Casurao said. Atty. Casurao said that the list of successful examinees will be posted at the NAPOLCOM central office located at the DILG-NAPOLCOM Center, NAPOLCOM Bldg., Edsa Corner Quezon Avenue, West Triangle, Quezon City, and can be viewed at the NAPOLCOM website at www.napolcom.gov.ph. Individual reports of rating will be mailed to all examinees. Verification of test results will be entertained at the NAPOLCOM central office and its regional offices nationwide in July 2017.